Pondering over what Costume theme should you choose for your Family this year? Bored of Pirates & Superhero’s! We have an amazing Halloween Costume Theme Idea if you are planning to have Family Group Costume Idea. Dress up as Flintstone & Rubble Family this Halloween to get back to Modern Stone Age Era! Fred Flintstone, Wilma Flintstone, Barney Rubble & Betty Rubble are characters loved today also by Kids and adults equally. Flintstones is the Fantasy version of the Stone Age where caveman Fred & Barney share their life experiences. These cavemen are just are any other modern men – they drive cars made of stone, wood & animal skin, they go out to restaurants to eat, they listen to records, they have stone telephones – they have all we have in the Modern Age in the Stone Age. Get to the Stone Age this Halloween in our range of Flintstone Costumes. Fred Flintstone is the head of the Flintstone clan. He works in stone quarry and is very accident prone. He is loving & caring husband and father. 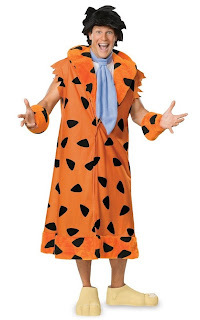 Dress in this Fred Flintstone Costume this Halloween. Costume includes Signature orange with black coat with attached collar, matching cuffs, blue necktie and black wig and "bare feet" shoe covers. This is an officially licensed The Flintstones costume. Costume includes Coat with collar, necktie, cuffs, wig and shoe covers. Available in adult Plus size 44-50. This is an officially licensed The Flintstones costume. 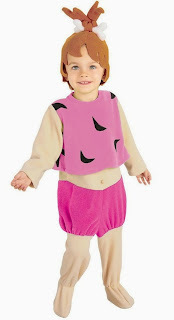 To get the real feel and surprise your Kids – Fred Flintstone Mascot Costume is great for you. Costume includes Mascot head with attached tie, plush tunic with attached sleeves, pants and shoe covers. Does not include club. This is an officially licensed Flintstones product. 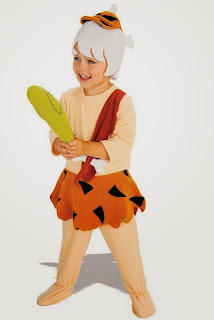 Get Yabba-Dabba-Doo in Fred Flintstone costumes! Fred’s wife Wilma is like any other American wife. Loving and caring about her wife. Wilma is far more intellectual than Fred. She loves shopping & hanging around with her best friend Betty. Gift Wilma Flintstone Costume to your wife this Halloween Season. This costume includes white dress with zebra tattered trim on hem and one shoulder strap. Orange wig and white "stone pearl" necklace are included. Shoes, earrings, and ring are not included. This is an officially licensed The Flintstones costume. P.S: You would need no other accessory with this costume! Wig & White Stone Pearl necklace are included in this costume. Charge It with Wilma Flintstone Costumes this Halloween. Deluxe costume includes white dress with zebra tattered trim on hem and one shoulder strap. Orange wig and white stone pearl necklace are included. Shoes are not included. This is an officially licensed The Flintstones costume. To complete Flintstones Costumes we have Pebbles Flintstone Costume. Cuddly and cute, Pebbles is the apple of her parents' eyes. This Costume is available for Toddlers, Teens & even for your college going kids. Costume includes Hot pink with black spotted tattered shirt, black tattered shorts, hot pink wig with bone attached and hot pink tattered leg coverings. Earrings and shoes are not included. This is an officially licensed The Flintstones costume. This costume comes with shirt, shorts, leg covers and wig. Shoes not included. Costume is available in One Teen Size Only. This costume includes a fleece jumpsuit with attached feet, and headpiece. Officially licensed Flintstones costume. This completes your Flintstone Family for your Halloween Theme Costume Party. Barney is one Happy-go-Lucky guy and Fred Flintstones Best friend. Get your friends and their family also involved in this Halloween Group Costume Theme. 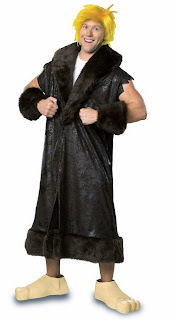 Barney Rubbles costume includes Brown coat with faux fur trim collar and matching cuffs, blonde wig, and "bare feet" shoe covers. This is an officially licensed The Flintstones costume. Costumes includes Coat with collar, cuffs, wig and shoe covers. Available in adult plus size 44-50. This is an officially licensed The Flintstones costume. Barney Rubble’s wife & Wilma’s Best friend, Betty is charming & adorable. He is the strongest child. Bamm-Bamm is adorable & strong. Get in Yabba Dabba Doooo....... mode in these Flintstone Halloween Group Costumes.